There have been a few recent updates from those pesky craftsmen! They try to intercept my finances when I am supposed to be buying Christmas presents for Mrs S! "Luckily" for me, I had saved up and already spent a fortune on Mrs S and then I still had some money left over for some new treasures from the "Published professor of wood", Brian Menold and I missed out on Eric's update due to work - sob! 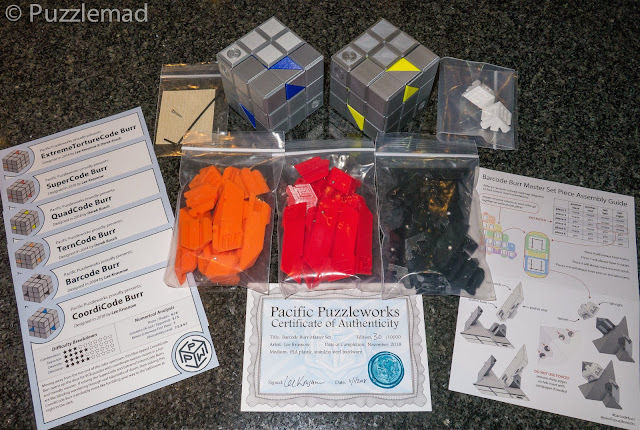 I still had a couple of his packing puzzles from the previous release which I have gotten absolutely nowhere with and so this time I focussed on just the interlocking puzzles that he had produced. 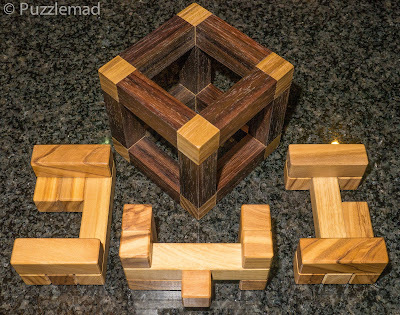 At the very top of his New puzzles page, he had the Six face puzzle which was designed by a new designer (and craftsman), Andrew Crowell whom I had admired in this post in October 2017. If Brian says that something is good then I always listen to him as his taste is impeccable. I lurve TIC's and this is a VERY good example! Not only is this beautiful but it is also very very clever! A great puzzle from the best! 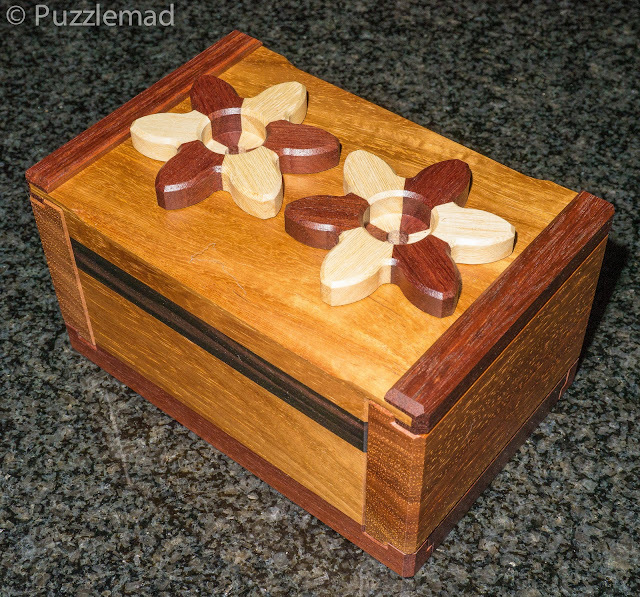 Summer - who can resist a puzzle with that name at this dreary time of year? Summer was irresistible to me! 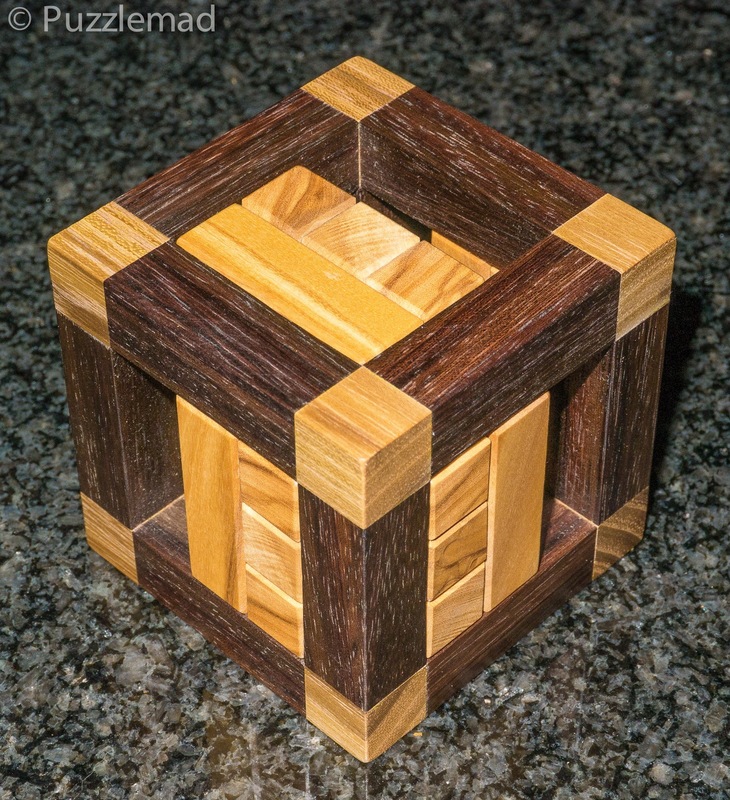 It is designed by one of my very favourite designers (and friends) Klaas Jan Damstra who always produces puzzles with something elegant and interesting to them...they are not always terribly difficult or high level but they are ALWAYS very satisfying to solve. 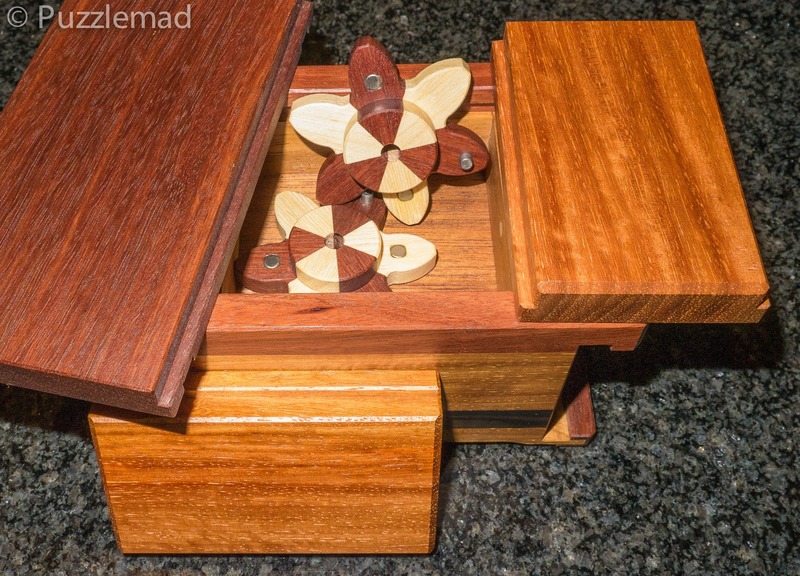 On top of that, the copy I bought was made with an East Indian Rosewood and Acacia frame with Olivewood pieces - it is truly gorgeous and I am a sucker for Olivewood (my Die Doolhof from Johan was made of Olivewood and I frequently play with it and admire the lovely markings). 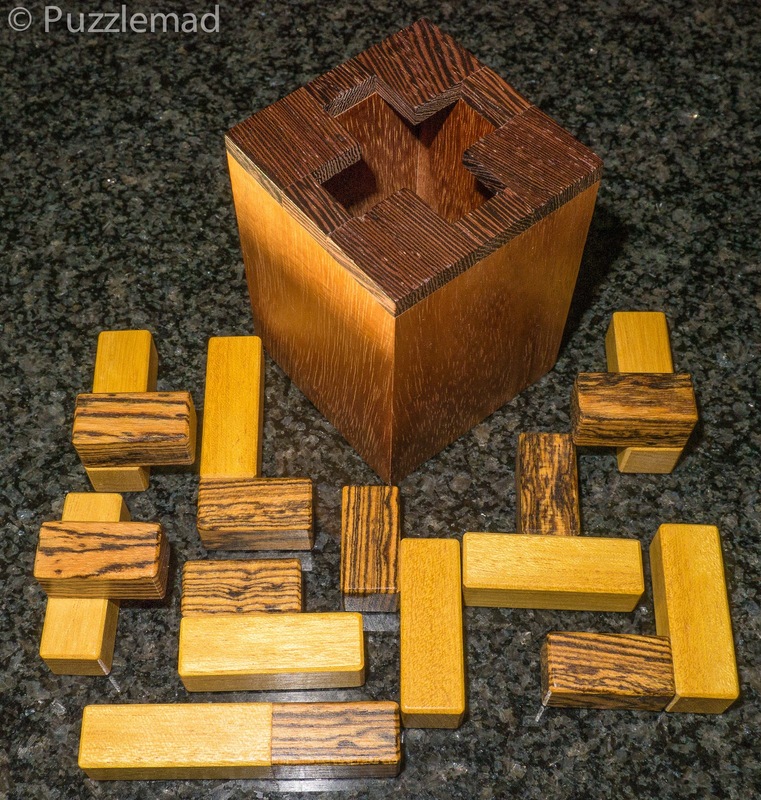 I was won over by Brian's description that it was just a simple frame and 3 simple pieces - some of the very best puzzles ever have been very simple in idea as well as piece number and construction - for example from this year, Chris Lohe's Trenta was amazing as was Osanori Yamamoto's Lucida. 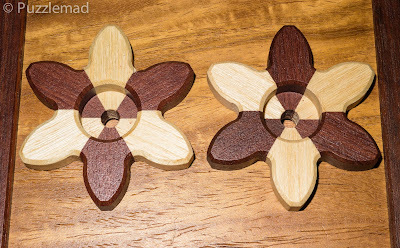 The Summer puzzle is lovely to play with due to the smoothness and warmth of the wood and has a very enjoyable sequence of 14 moves for the extraction of the first piece. If you have the puzzle orientated nicely then it can almost be solved one-handed with some very satisfying clunking noises as the pieces move. It took me an hour to dismantle it and due to the small number of pieces, I decided to scramble them and leave them for a while. This definitely could have been sent out as an assembly puzzle and would have been almost as much of a challenge as the pair above. 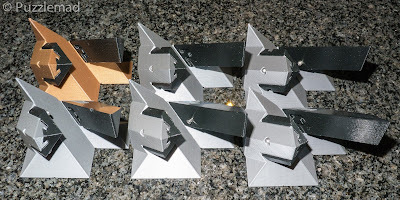 I am definitely not a puzzler of the calibre of my friend, the late Laurie Brokenshire, who had his wife Ethel dismantle everything first so he always had an assembly challenge but the Summer puzzle would have made a really good challenge like that. Even having disassembled it a couple of hours beforehand, the reassembly took me another good hour! But then, you all know that I am not very bright! 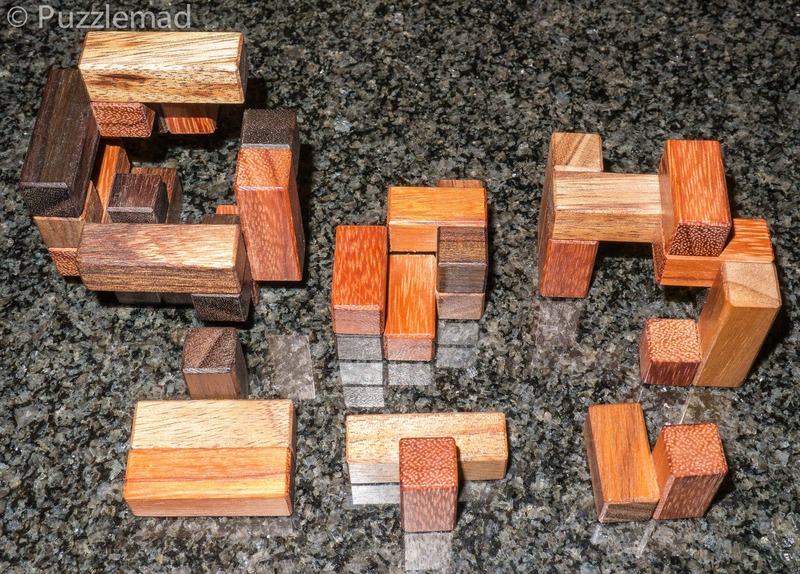 Thank you, Brian, for a beautiful set of puzzles and some amazing challenges this year. I look forward to more in 2019. Talking of 2019 - it is that time of year again! Come back on New Year's Day for my Top 10 puzzles of the year! No! It's Super... A Sequential Discovery Puzzle! In mid-November, Juno and Yukari announced the release of the last of 2018's production from their Pluredro store. 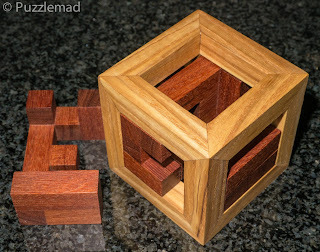 This was to be a rather special puzzle with a very odd name...the Sequential Discovery Burred Box. It looked just like a large 6 piece burr but was a moderately high price for a simple 6 piece burr. BUT, ⅔ of the batch of 70 sold out within 24 hours and they were all gone within a week! This must be one hell of a special burr! Yes, of course, I bought one! I was eating my lunch when the email came in and I had made the purchase within 10 minutes. I'm a sucker for Burrs, especially ones designed and made by Junichi Yananose. So what was so special about this 6 piece burr? 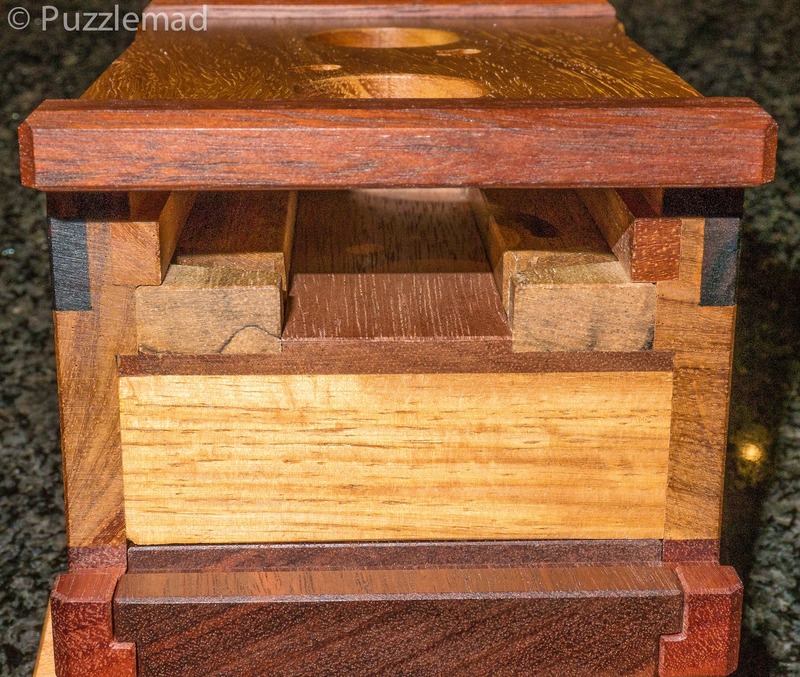 The clue is in the name...it's also a box. I really don't collect boxes unless there is something special about them (many puzzlers around the world have been receiving their Karakuri Christmas presents this week but not me - I realised that membership of that club might well end up with me divorced and destitute and I have so far resisted all these years). Now if I don't do boxes and it's just a simple (if rather chunky) 6 piece burr then the reason it is special is those wonderful words..."sequential discovery". These puzzles are the rarest of the puzzle classification and, due to the complexity, are often the most expensive. I was helpless to resist. 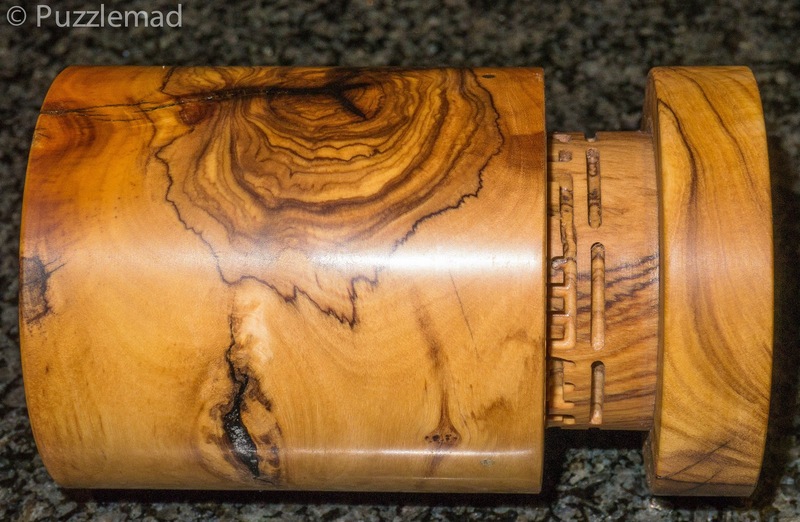 When it arrived it looked like a pretty straightforward burr - it was really pretty big for a 6 piece burr at 101mm cubed and made of PNG Rosewood, Jarrah and Ironbark (small piece) with small metal parts inside. The colours in the wood need to be seen to be properly appreciated. 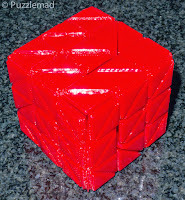 I cannot show any of the intermediate steps here without giving far too much away to people who have not yet received or solved their copies but let us just say the burr functions are very strange - no pushing or pulling on any of the sticks does any of the usual things until suddenly a very unusual thing occurs. Immediately the discovery is underway as a tool is available for all to see and some of those metal parts are now on show. There is an obvious place to use that tool but that just puts it out of reach and nothing happens. A quick inversion and the tool drops back into your hand and you need to search for another tool to use alongside the first. Pushing and pulling quickly reveals a potential tool but now what? Think© and you will have a brainwave before trying something intuitively rather wrong. Even though it screams the wrong thing to do, you have no other option and suddenly the tools are returned to you and there appears to be another few places where tools can go. Yep! You guessed it...it doesn't work! Try looking around a bit more! The next move took me a whole day to work out! I got fixated on the obvious 2 things and could not seem to see the next step even though it was staring right at me! Eventually, my rather dim noggin saw what was required and... it wouldn't work! Was I wrong? No. I was doing it wrong! Look carefully at what you have and you will notice minute differences in size and shape and orientation. Use that and success will be yours. Aha! I had another rather odd looking tool. This opened another whole realm of possible uses of tools in combination and again I got fixated on the wrong thing. Another day went by before a particular feature of one of the tools hit me between the eyes. It's not much of a cavity - at only 39mm long, 13mm wide and 19mm deep. It barely classifies as a box at all. In fact, for me, the cavity is totally incidental. At least this time Juno had not put anything inside which was aimed at winding me up! like he had in previous puzzles here and here. Reassembly is pretty easy but it is nice to work out the most efficient way to put it all back together without having to redo too many steps. Yep! It's not much of a burr and not much of a box but it's a lovely sequential discovery puzzle. Thanks, Juno and Yukari! I cannot wait for next years designs to come through - actually I am still coveting a couple of the designs from this year which I have not got around to buying yet. Don't tell Mrs S as she won't be happy! Whack! Ouch! 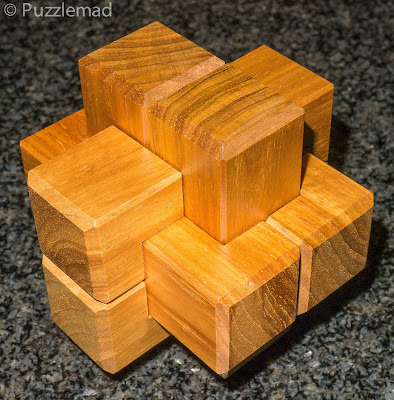 Have a great Christmas all you puzzlers and poor significant others of puzzlers out there! Have a great time...try to relax and not eat and drink more than is good for you. Actually, try to stop before you burst or get admitted to the emergency room - if you are admitted on Xmas day then you may find me looking down on you on your trolley! I have a certain set of skills! Ho! Ho! Ho! 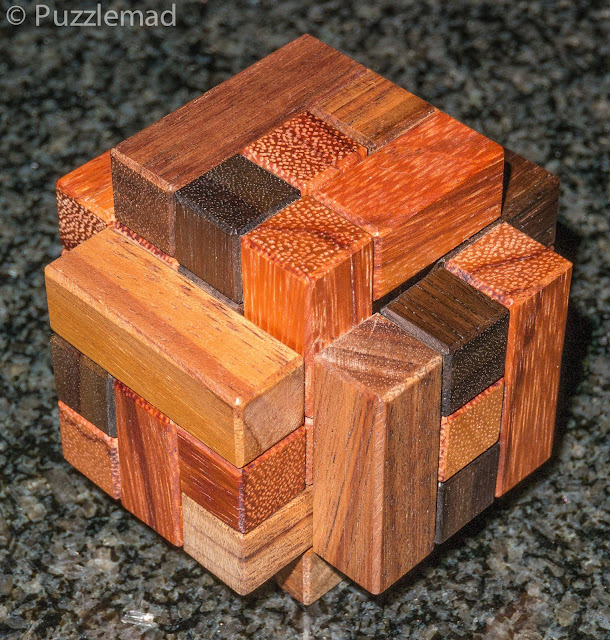 I am not sure when I first saw this but it has really taken the puzzle world by storm! 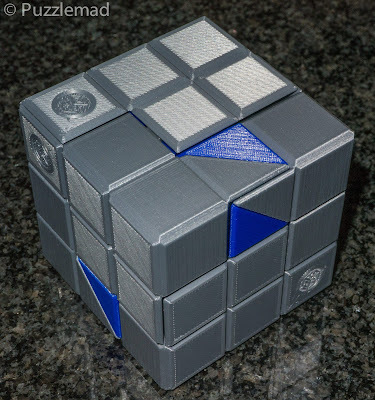 Lee Krasnow is an amazing talent who has branched out into 3D printed puzzles which he is currently selling on his Etsy store. Have a browse around - there are quite a lot of fabulous designs which are generally unaffordable to the majority of us when made in wood but in plastic (whilst not as nice) they become accessible to the majority of puzzlers. Most of us, at some point, have drooled over his Barcode burr in wood but very few were made and if they ever come up at auction go for $1000s (Allard wrote about it here). 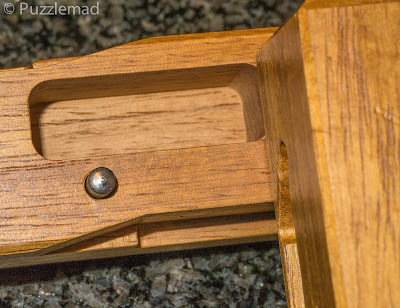 It would appear that he and the other genius, Derek Bosch, began a collaboration based on Lee's knowledge of the Barcode burr and Derek's incredible knowledge of Burrtools and non-rectilinear grids. 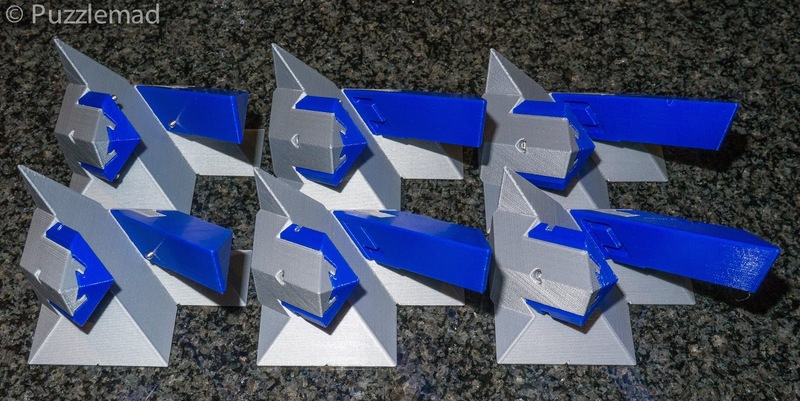 Between them, they managed to produce designs for extensions of the original Barcode burr and Lee decided to produce a kit to extend the 3D printed Barcode burr that he had previously released. The whole lot he named the Barcode Burr Master Set which was effectively a kit for the production of 6 puzzles. It's not cheap but you get a LOT for your money. 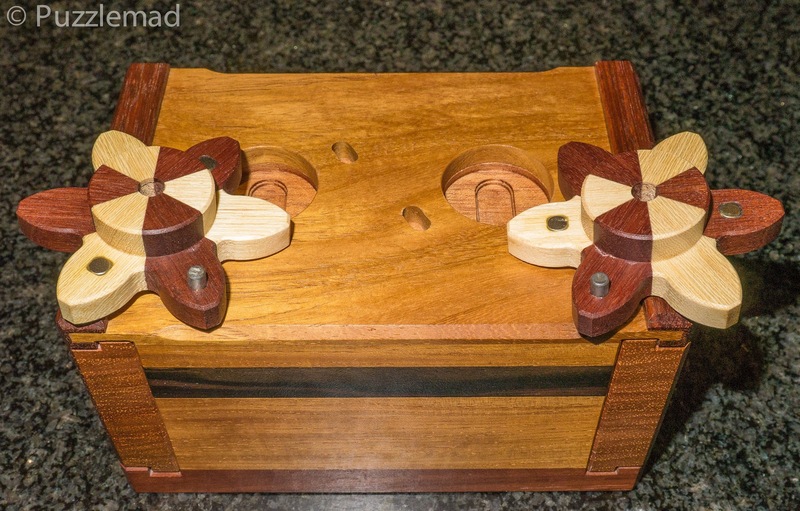 It is beautifully presented with all the pieces bagged in groups, a set of screws and a hex key. There is also a bunch of envelopes containing cards with a certificate of authenticity as well as puzzle summaries and assembly instructions. 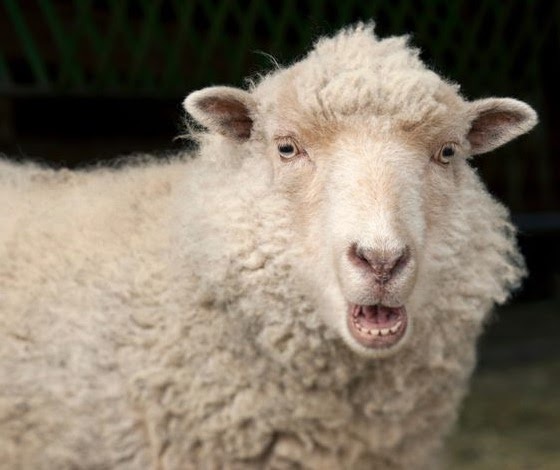 "like fumbling your way to the bathroom in the dark"
It would appear that just as I removed the first piece of this particular puzzle my jaw dropped and I assumed the full sheep expression! Yet again I show to my beloved that I am not terribly bright! I had absolutely no idea how I had done it and at that point, it was time to go to bed and leave it at that. 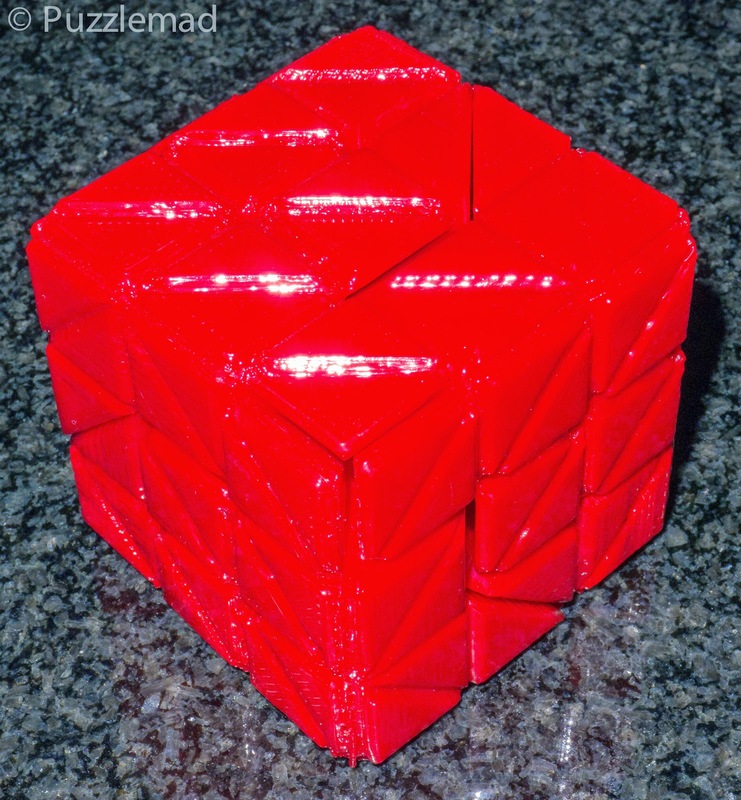 The following day I spent over an hour before I was able to return the cube back to it's assembled shape. Wow! That is confusing. I then proceeded to try and repeat it and continue the disassembly. It's actually quite a fun process and eventually I had to concede that it was not that tough. Reassembly from scratch after scrambling the pieces is particularly fun but quite possible once you have understood it. Next up it was time to set up another in the series - I was going to go in ascending order of difficulty and this meant making a copy of the Barcode burr itself. It had been a long time since I had played with my copy bought from "Small explosive Steve". The brown coloured piece is number one to help keep track of moves. At least with this one, there was no repeat of the sheep expression! Of course, the next challenge was to take it apart again so that the assembly of the next up in the series can be done. It shouldn't take you long as the level is 33.16.6.5.4 if you assemble it correctly. Improper assemblies will allow lower move counts. 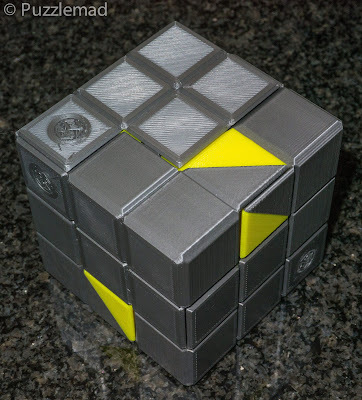 "If you have already mastered the classic Barcode burr puzzle, then your muscle memory might even work to your own disadvantage here..."
I really struggled for a while on this even if it should have been just a simple step up in difficulty. The level for the disassembly is 115.22.10.5.2 which is a nice number of moves. "Moving the exit notches to the inward position on this burr comes at the expense of adding evil twists and turns to the otherwise orderly seeming mazes, and in general, throws all sense of fair play out the window! Say hello to blind alleys with pieces locking up unexpectedly..."
The Quadcode is actually easier to understand than the Terncode but very arduous in its solution. The level for disassembly is 1233.320.78.25.8 but I have to admit that the number of moves that I made was considerably higher! I'm knackered after just assembling it and now need to take it apart so I can attempt the Supercode. Easier to understand but a bit of a monster! This is a fabulous kit! Thank you, Lee, for making it available and Thank you, Derek, for helping extend the scope of the original puzzle. If you have even a vague interest in N-ary puzzles as well as hidden maze type puzzles then this is a great purchase for you. Now hopefully Mrs S will stop laughing at me in the image of a sheep for long enough for me to have a conversation and be able to concentrate on another in the series as well as some other new arrivals. 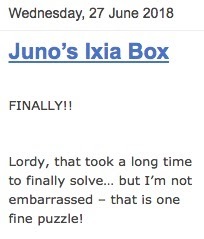 The puzzle that I am reviewing today is called the Ixia box (named after the 2 flowers that adorn the top) and I saw it go up for sale on Juno and Yukari's Pluredro site (please note that it is now out of stock) and I duly ignored it because it's a box and I don't collect boxes. That's my story and I'm sticking to it! However, I saw it at the Midlands Puzzle Party in the spring and had a little play myself and did not get very far. 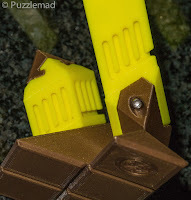 What I did realise was that there are bits that come off and can be used as tools later on. 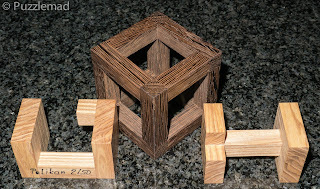 In other words, it is partially a sequential discovery puzzle and I definitely DO collect those! Whatismore, out of the corner of my eye, I caught sight of Mr Strijbos and Mr Coolen (the puzzle solving machine) working on it and getting quite excited at times. At the end of the MPP they had solved it and after a brief chat, they had me convinced that it would be a fabulous puzzle for me to own and solve. It duly arrived at the end of April this year and after catching up with one or two other puzzles, I set to. No wonder they would not rotate! There are pins and magnets and the reason that the flowers don't turn becomes quickly obvious. Not being very good at boxes, I am at a bit of a loss for what to do next. 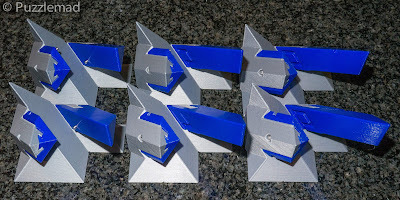 Magnets!!! They must be there for a reason so I hover them over the rest of the box and get a sort of hint that there are other metal things inside but it's not terribly convincing...or terribly useful. Stuck already! Yep! I am stupid when it comes to boxes - Mrs S told me that I had my Plug face on. Attractive aren't I? It took me another hour maybe to find the next move and suddenly I had a cavity. YES!!! I had solved a box. Or had I? As cavities go it really doesn't look like much! Looking at it, I did realise pretty much straight away that this was only an interim stage and there was quite obviously more to go and presumably the main cavity still to be found. I spent another few hours getting not much further - inside the box there appear to be some CNC cut grooves towards the edges and they are obviously intended for some special use. Needless to say, I was only vaguely able to see these inside the cavity and committed the cardinal sin of cheating! I put my fingers inside and played with the grooves until something happened. Please don't be shocked - I am not a box person, I am not terribly bright and Allard had already done the same thing (go on - go back and read his review). Either way, what I had done did not feel very satisfactory so I put it all back and had a think©. Interestingly, this one time that thinking thing actually worked! I made some lovely discoveries and realised that opening the second door could be very elegant indeed. If you stuck your fingers in and pushed something then STOP THAT! Take them out and play nicely! ...And that's where I got stuck! For days, and weeks and months! Allard's review was published and I still had gotten nowhere! I wasn't handicapped by his so-called friends putting distracting things inside to make noises that were of no use whatsoever. I had a pristine puzzle and could find no way to open the final door to the main cavity. I worked on it off and on with no progress at all. I made some discoveries but could not formulate them into a solution and here we get to the title of the post. 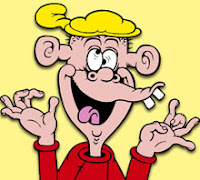 A certain Ed has appeared at a few recent MPPs and has distinguished himself by singlemindedly sitting down and working his way through quite a lot of Karakuri puzzles and a huge number of puzzle boxes. He collects them himself and has developed quite a talent for solving them. This talent even included him solving the Ixia box without too much difficulty. Everyone at the MPP is very impressed by his HUGE........prowess! Why? Because he manages to solve a lot of very difficult puzzles despite being completely blind! Obviously, some of his other senses have improved as compensation and I reckon that he can actually smell a solution! I have been chatting to him on Facebook messenger on and off over the last month or so and we seem to share a very warped sense of humour and a love of Juno's toys. We also share the fact that his fiancé is a medic so he understands some of the stresses and maybe sympathizes with my puzzle addiction all the more. Ed gave me a very small clue at the beginning which, with me being very dense, did not help me at all. A few weeks later that was followed up with another, less subtle, clue. Hmmm! Nope! 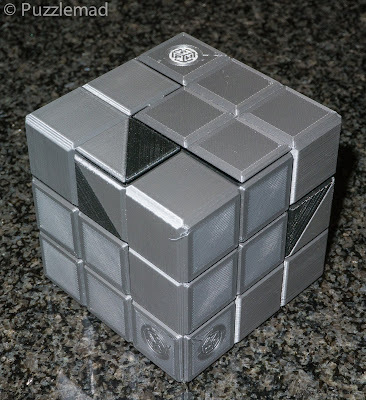 Absolutely genius puzzle - only took me 8 months and a number of less than subtle clues to solve it! Thanks so much, Ed! Great to have you as a puzzle friend! Wow! This was an amazing odyssey. It took me nearly 8 months to complete this puzzle and my only excuse is that I am not very good at boxes, or sequential discovery puzzles, or other puzzles for that matter. 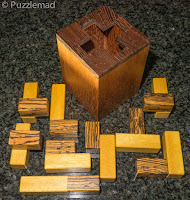 But I do enjoy being puzzled and this one was a fabulous challenge. 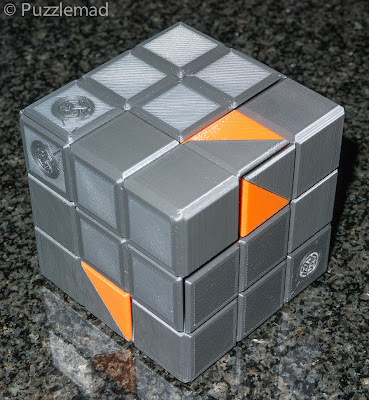 Unfortunately, it is not available any longer but if you get a chance to play with one at a puzzle party or see one up for sale at an auction then go buy it - you won't be disappointed. Juno's latest sequential discovery box/burr went on sale a few weeks ago and sold out completely in just a few days - my review will be coming soon. 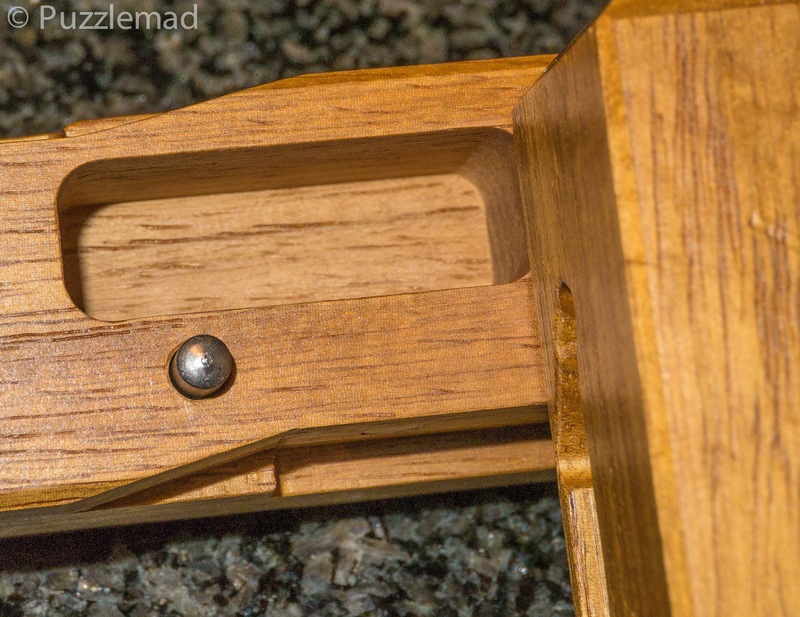 The "sequential discovery burred box"